NO LATE SEATING. Please arrive 30 minutes prior to curtain. Writer and performer Aaron Davidman’s acclaimed solo show is a personal story that grapples with the complexities of identity, history and social justice. Follow one American’s journey to understand the Israeli-Palestinian conflict as Davidman sheds a bright light on one of the most entrenched conflicts of our time – yet offers no sweeping generalizations or easy answers. Directed by Michael John Garcés. Photography by Ken Friedman, Tom Kubik, Wolfgang Wachalovsky, Allen Willner. CG: What was the impetus for Wrestling Jerusalem? AD: The play was a commission from Ari Roth, then artistic director of Theatre J in Washington DC, and now the founding artistic director of Mosaic Theatre of DC. We wanted to push the public conversation about Israel/Palestine towards a more nuance complex conversation, especially in the American Jewish community, but also in the community at large. CG: Why did you feel it was important to create this piece? CG: I have read that you don’t want this to be considered a political piece that you really want audiences to look a the people in this conflict, can you expand on that? AD: I never said it’s not a political piece. It’s definitely political. I guess all art, on some level, is political, even it’s not overtly so. But what I have tried to do is give voice to range of perspectives so that we’re not stuck in the same old political discussion. That might meet see the humanity and multiple perspectives of this and other polarizing issues as well. CG: As this conflict is still talked about, what do you hope audiences walk away with after seeing this piece? AD: I hope they’ll soften their armor and let in some new points of view. CG: Do you have any connections to the Philadelphia area? AD: I have a cousin who is a Rabbi in town. But other wise, Philly is new to me! CG: About the Film/vs. the Stage Show; Which came first? AD: The film is based on the stage play, which came first. The film is the same text as the stage play, but shot in three different locations: before a live audience, in the intimacy of the dressing room and in the expanse of the desert. CG: Why do you feel people should see it on stage? AD: The stage play is theatre. And the film is film. They are two different artistic mediums and one doesn’t replace the other. The live show is alive only each time I do it. And sharing the narratives in the room with and audience—they’re nothing quite like it. AARON DAVIDMAN is a playwright, director, actor and producer. He served as Artistic Director of Traveling Jewish Theatre in San Francisco from 2001 – 2011. Among many projects at TJT, he co-wrote and directed the international collaboration BLOOD RELATIVE about the Israeli-Palestinian story, directed TJT’s critically acclaimed production of DEATH OF A SALESMAN and co-wrote and performed in GOD’S DONKEY which toured the United States. 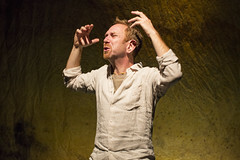 He originated the role of Momik Neuman in Corey Fischer’s Kennedy Center Award winning play SEE UNDER: LOVE, based on the David Grossman novel. 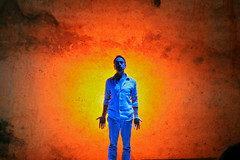 Beyond TJT Aaron directed GOLDA’S BALCONY and THE CHOSEN at Theatreworks and the world premiere of THIS WORLD IN A WOMAN’S HANDS by Marcus Gardley at Shotgun Players. He also directed the world premiere of Gardley’s LOVE IS A DREAM HOUSE IN LORIN at Shotgun for which he was named Best Director of 2007 by the East Bay Express. And the world premiere of Gardley’s THE ROAD WEEPS, THE WELL RUNS DRY at Perseverance Theatre in Juneau, Alaska. Aaron is the author of WRESTLING JERUSALEM, a play that received it’s premier at Intersection for the Arts in San Francisco March 12 – April 6, 2014. The play was commissioned by Theatre J in Washington DC and supported in part by the Sundance Institute Theatre Program, TJT and Playwrights Foundation. As an actor he has performed at SF Playhouse, California Shakespeare Theatre, Utah Shakespearean Festival, Shotgun Players, Theatre J, Arena Stage, and other theatres. Sun. 10/22 curtain @ 3pm - Join us after the show for an Audience Q+A conversation with playwright Aaron Davidman. Tues. 10/24 curtain @ 7pm - JCRC invites students and teachers of all backgrounds to expand their understanding of the Middle East conflict through an evening of exploration and conversation with playwright Aaron Davidman. Begins right after the show. Thurs. 10/26 curtain @ 8pm - Join us following the performance for a post-show onstage conversation between playwright Aaron Davidman and Ruby Namdar, author of The Ruined House (released Nov. 7), which received Israel's highest literary honor, the Sapir Prize. Fri. 10/27 curtain @ 8pm - Join us for a pre-show workshop beginning at 6:30pm, followed by a pizza dinner before 8:00pm curtain. This event is free. Wed. 11/1 curtain @ 7pm - JCRC invites you to an evening of exploration and conversation. Begins right after the show. Thurs. 11/2 curtain @ 8pm - JCRC invites you to an evening of exploration and conversation with playwright Aaron Davidman. Begins right after the show.